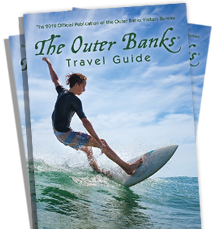 The Outer Banks is as far east as you can go without getting wet. With that simple truth in your back pocket, locate the direction you're coming from below and read our easy-to-follow instructions. They're guaranteed to alleviate the need to stop and ask. 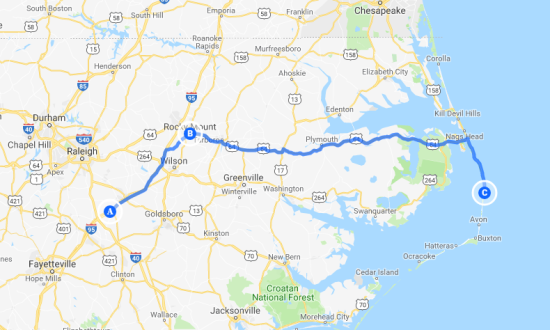 Follow I-95 South to Richmond, VA. Take I-64 East toward Norfolk/Virginia Beach, Va. Take I-64 or I-664 to Chesapeake, Va. From I-64, take Exit 291B to Route 168, the Chesapeake Expressway. * Once in North Carolina, Route 168 turns into US-158 East. Follow this road to The Outer Banks. *Chesapeake Expressway is a toll-road with new rates that took effect May 1, 2011. EZPass and SmartTag accepted. Avoiding Toll Charges on Route 168 (Chesapeake Expressway), take exit 8B off of Route 168 South (Hillcrest Parkway Exit), turn right at second traffic light (near Wawa) on to Battlefield Blvd. (Route 168 South Business). 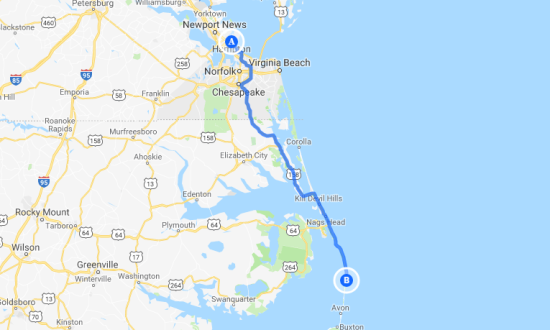 From Virginia's Eastern Shore across the Chesapeake Bay Bridge Tunnel (Route 13), follow Route 13, Northampton Boulevard, to I-64 East (to Chesapeake), take Exit 291B to Route 168, the Chesapeake Expressway. * Once in North Carolina, Route 168 turns into US-158 East. Follow this road to The Outer Banks. *Chesapeake Expressway is a toll-road with new rates that took effect May 1, 2011. EZPass and SmartTag accepted. Via I-95 or I-85 into North Carolina. Take US-64 East toward Rocky Mount. Follow US-64 East through Williamston and Plymouth, NC. 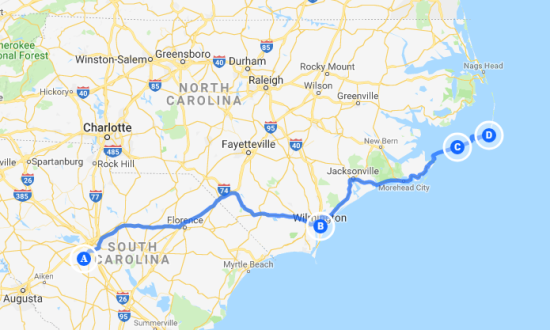 From Plymouth, NC keep going east to Roanoke Island and The Outer Banks. Take I-95 to Rocky Mount, NC. Take US-64 East toward Rocky Mount. Follow US-64 east through Williamston and Plymouth, NC. From Plymouth, NC keep going east to Roanoke Island and The Outer Banks. Take US-17N from South Carolina to Wilmington, NC. From US-17N take State Route 24 east until it runs into US-70 (before Morehead City, NC). 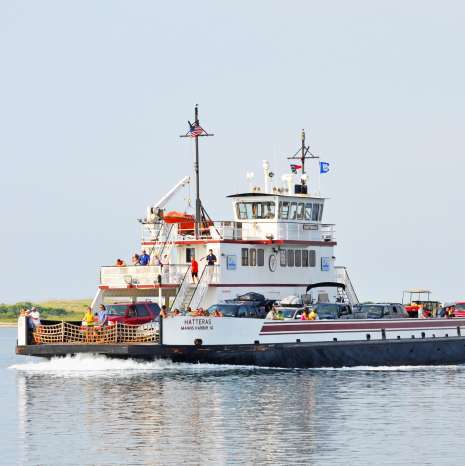 Follow US-70 North from Morehead City to State Route 12 and the Cedar Island Ferry. Take the toll ferry to Ocracoke Island. Then take State Route 12 north to the Hatteras Island Ferry. Myrtle Beach, SC 321 mi. New York City, NY 503 mi. Rocky Mount, NC 154 mi. 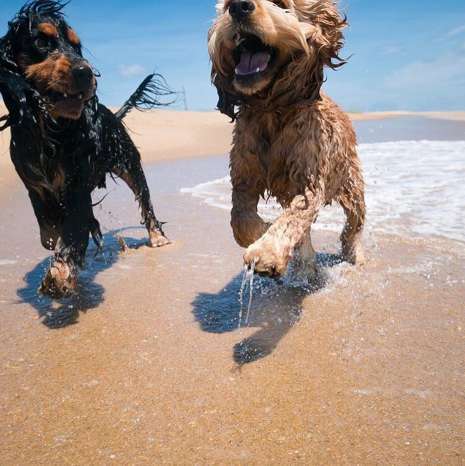 Our beaches, towns and villages can be fun and rewarding for both pets and their owners. Turn RIGHT toward I-64/Airport Exit. Turn LEFT onto NORVIEW AVE. Merge onto I-64/HAMPTON ROADS BELT toward VA BEACH/CHESAPEAKE. Merge onto I-464 S/US-17 S/MARTIN LUTHER KING JR MEMORIAL HWY via EXIT 291B toward VA-104 S/ELIZABETH CITY/US-17 S/DOMINION BLVD/VA-168 S.
Merge onto VA-168 S via the exit on the LEFT toward NAGS HEAD/MANTEO (Portions toll). 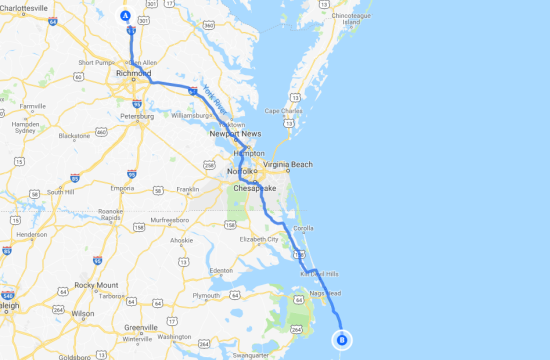 VA-168 S becomes US-158 S.
Follow I-95 South to Richmond, Va.
Take I-64 East toward Norfolk/Virginia Beach, Va.
Take I-64 or I-664 to Chesapeake, Va.
From I-64, take Exit 291B to Route 168, the Chesapeake Expressway. *Once in North Carolina, Route 168 turns into US-158 East. (Avoiding Toll Charges on Route 168 (Chesapeake Expressway), take exit 8B off of Route 168 South (Hillcrest Parkway Exit), turn right at second traffic light (near Wawa) on to Battlefield Blvd. (Route 168 South Business). Follow this road to The Outer Banks. *Chesapeake Expressway is a toll-road with new rates that took effect May 1, 2011. EZPass and SmartTag accepted. 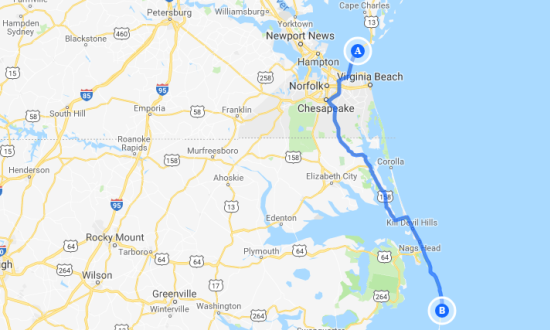 From Virginia&apos;s Eastern Shore across the Chesapeake Bay Bridge Tunnel (Route 13), follow Route 13, Northampton Boulevard, to I-64 East (to Chesapeake), take Exit 291B to Route 168, the Chesapeake Expressway. *Once in North Carolina, Route 168 turns into US-158 East. Follow this road to The Outer Banks. *Chesapeake Expressway is a toll-road with new rates that took effect May 1, 2011. EZPass and SmartTag accepted. Get off I-64 at Hampton, Va.
Go South on I-664 through Monitor-Merrimack Memorial Bridge-Tunnel. Take I-64 toward Norfolk/Virginia Beach; then go south on US-17 at Deep Creek, Va. to South Mills, NC. 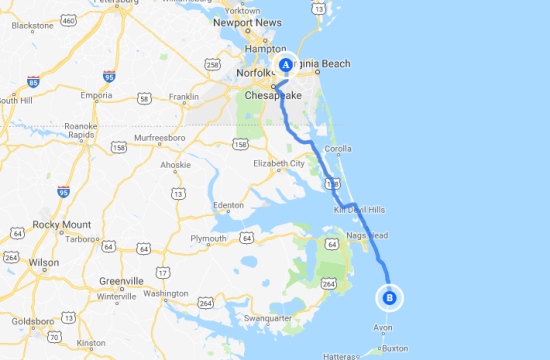 Follow NC-343 south to US-158 South to The Outer Banks. Via I-95 or I-85 into North Carolina. Take US-64 East toward Rocky Mount. Follow US-64 East through Williamston and Plymouth, NC. From Plymouth, NC keep going east to Roanoke Island and The Outer Banks. 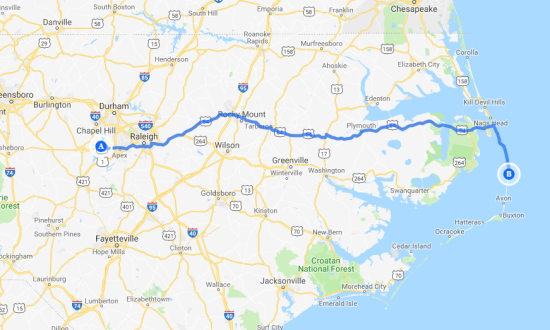 Take I-95 to Rocky Mount, NC. Take US-64 East toward Rocky Mount. Take US-17N from South Carolina to Wilmington, NC. From US-17N take State Route 24 east until it runs into US-70 (before Morehead City, NC). Follow US-70 North from Morehead City to State Route 12 and the Cedar Island Ferry. Take the toll ferry to Ocracoke Island. 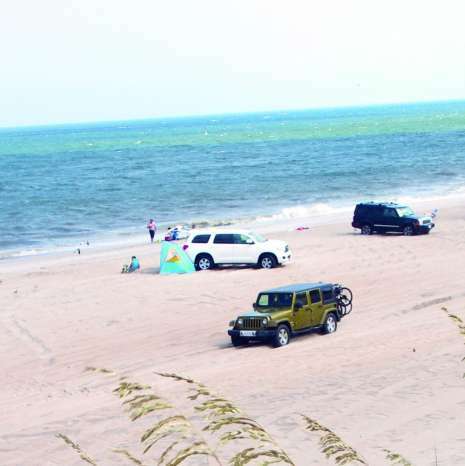 Then take State Route 12 north to the Hatteras Island Ferry.